I can tolerate Thanksgiving leftovers for a day or maybe even two. By then I’m so over the turkey that I can’t stand the thought of eating another sandwich! I’m betting that at least a few of you feel the same way. Well no need to throw out that turkey or force down another sandwich because I have come up with a solution. 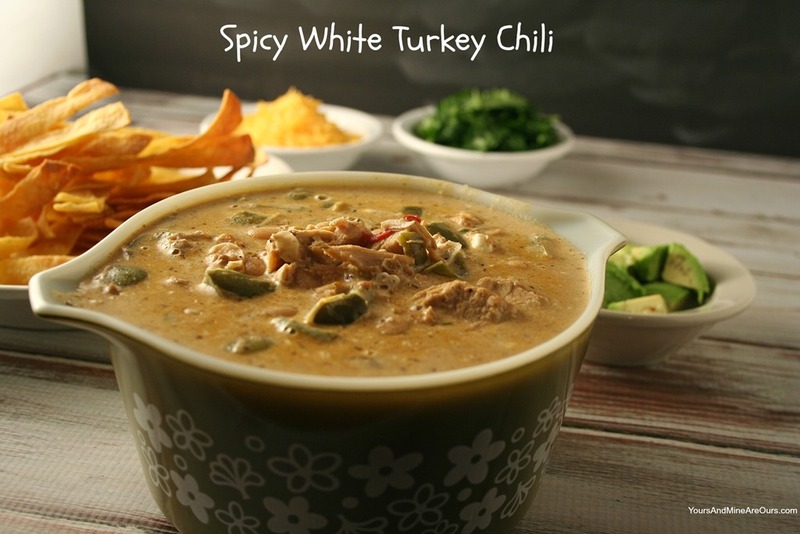 This Spicy White Turkey Chili Recipe is amazing. It’s so good you won’t even realize you’re eating turkey! This soup is creamy, spicy and full of flavor! You will be so glad that you had leftover turkey to use up. The broth alone is amazing. I think I could eat it with the guacamole and cilantro and be very satisfied. I hope your family loves it as much as we did. Melt butter in a Dutch Oven and then add diced turkey. Heat through, stirring every few minutes. Once heated through set aside. Add 4 tablespoons olive oil to the pan with the bell peppers, garlic, chili powder, 3 bouillon cubes and oregano. Cook 5 minutes –stirring frequently. Add the jalapenos to the pan and cook an additional 3 minutes. At this point if your bouillon did not dissolve completely just smash it with your spoon and stir to mix. Add the beans, 3 cups of water and turkey to the mix. Stir well and add salt and pepper to taste at this point. 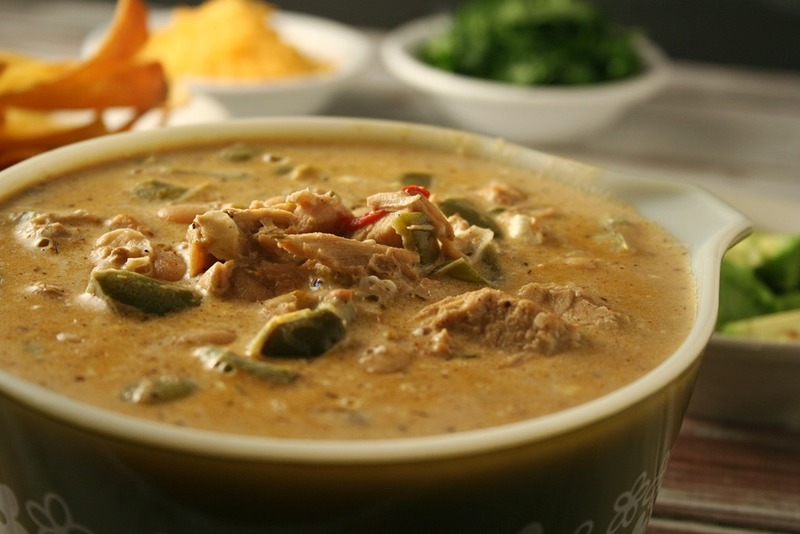 Simmer 25-30 minutes. Reduce heat to low and add the cream cheese. Stir until it is dissolved completely. Put a lid on the pan and let it cook on low heat for 5 minutes. While soup is simmering prepare your tortilla strips. Preheat oven to 375 degrees. Lay one tortilla flat and brush top side with olive oil, layer another on top and again brush olive oil on top side. Continue layering and brushing olive oil till you’ve prepared all 12. Separate into 3 stacks of 4 and cut into 1/2 inch strips. Layer singly onto a greased cookie sheet. Cook 10 minutes. Flip them over and cook an additional 5 minutes. They should be crispy at this point. Serve soup with desired garnish. Note You can make this without the jalapenos and half of the chili powder if you prefer a mild soup. Thank you for stopping by! I think you could probably substitute chicken for turkey and it would still be delicious. What a great way to use up all that leftover turkey meat! Your chili looks wonderful! Thanks Maria! I always struggle with a way to use up all of the turkey leftovers and I cannot throw them away. It just seems wrong to do so. You're welcome Jess. Thank you for stopping by and for the great compliment. You could totally make it with chicken and get similar results. Thanks for coming by and for leaving such a sweet comment! Wow-I keep thinking, do not make so close to Christmas...then I think, a soup so rich has GOT to be good, and if I can get some cream cheese ordered next week, I may just crack and make this creamy soup. I looks so good, and I'm sure some homemade corn tortillas would go perfectly with it! Oh you will love this and be so glad you did! Do you have turkey for Christmas? If so you could always make it a day or two after. Love the idea of having homemade corn tortillas with it - yum! Yay, I'm so glad that you liked it!